Whether you travel by plane a lot or take frequent visits to the vet, pet carriers are incredibly useful. They keep your dog safe, secure, and comfortable. But, as a dog ages, its needs can start to change. You need to have the right kind of carrier to maintain their comfort and make sure they don’t hurt themselves. That’s why we’ve selected some of the top dog carriers for older dogs. Senior dogs can develop a variety of health issues. Larger dogs can have joint problems and may have difficulty walking. Various conditions and diseases can also become more common as a dog ages. Keeping your dog somewhere they can relax while they’re traveling is essential. Even healthy older dogs will appreciate a soft, secure, and roomy space of their own. The personalities of senior dogs can sometimes change too. They may become clingy and want to be around you all the time. So, choosing the right carrier to make them still feel connected to you can make life easier for both of you. It’s not always easy watching your dog age. But, just because your dog is considered a senior doesn’t mean they don’t have many years ahead! As they do get older, the best thing you can do is to keep them happy, comfortable, and safe. 1.1 What’s the Best Soft-Sided Carrier? 1.2 What’s the Best Pet Crate? 1.3 What’s the Best Kennel? 1.4 What’s the Best Backpack? 1.5 What’s the Best Sling? 1.6 What is the Best Pet Stroller? In this guide, we’ll cover several of the best carrier options for your elderly dog. These are also good choices for dogs who may not be able to walk long distances or have certain medical conditions. There are many types of dog carriers, so we’ll look closely at the best ones and why they can help both you and your pet. What’s the Best Soft-Sided Carrier? 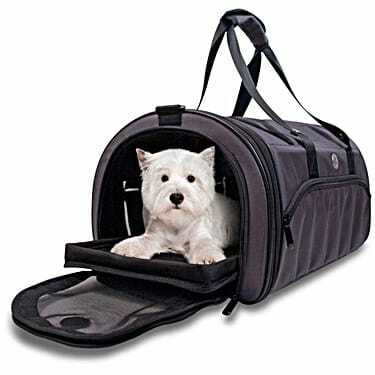 Soft-sided dog carriers are great options for older dogs because they provide greater comfort. That’s something any dog with joint issues or stiff muscles will appreciate. If your older dog has started to get anxious or nervous as they age, soft crates are useful because they are less likely to get injured or hurt themselves on any hard sides or bars. Our pick for the top soft-sided carrier is the Sherpa Original Deluxe Pet Carrier. The Sherpa Deluxe is considered a designer carrier, but it provides the comfort and security that you’ll appreciate for your old dog. You can trust the safety of the Sherpa Original Deluxe because it’s backed by several highly-recognized organizations. This includes the ASPCA and the Humane Society. Many veterinarians also recommend it as one of the best carriers available. But, you don’t even have to take their word for it. You can check out the features yourself to make the best decision for your dog. When it comes to safety and keeping your dog secure, this carrier is one of the best. Mesh sides: The mesh sides of this carrier allow for proper ventilation. This has several benefits for your dog. First, it will keep them from overheating. Having airflow through the carrier will keep them cool and comfortable. These sides also allow your dog to look out freely at their surroundings, which can keep them calmer. Finally, it gives you a chance to check on them in an instant without having to unzip the carrier or take them out. They’ll know you are there, and that can make a difference in how they handle the traveling experience. Zippers: The zippers on the Sherpa Original Deluxe lock. This helps to prevent your dog from escaping or the zippers from coming undone over time. The locking feature ensures that your dog will remain safely in the carrier at all times. Seat belt strap: If you’re taking your furry friend on a car ride, you’ll love the seat belt strap. It secures the carrier to the seat itself. So, whether you take a sharp turn or meet a bumpy road, your pet won’t get jostled around inside the carrier. This can keep their nerves down and can also keep them from getting injured or sick. This carrier is also extremely comfortable, which an older dog may appreciate even more than a younger one. It features a reinforced bottom that won’t sag or tear, so your pet can stay secure inside the carrier. That bottom is covered by a faux lambskin liner that can easily be removed and washed at any time. It’s also leak-proof! So, if your older dog has an accident, you can take care of it quickly. The liner will keep your dog warm and cozy, thanks to how plush it is. Finally, this carrier has several pockets that make it easy to store things. For older dogs, this can be convenient for storing medication, treats, etc. You’ll have everything to take care of your pet in one convenient location, so whatever you need can be grabbed at a moment’s notice. What’s the Best Pet Crate? Dogs are natural den animals, so many of them feel more comfortable and secure in a crate or kennel. Kennels can either be used to take on your travels or as a more permanent fixture in your home that your dog can use as their own ‘home.’ So, depending on your needs, we’ll cover both types of kennels. 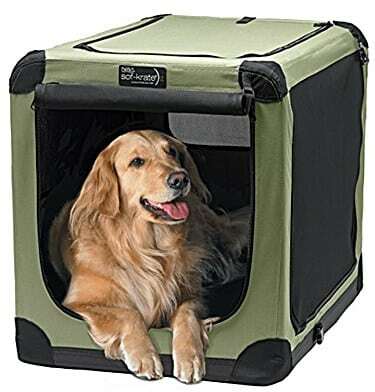 One of the best traveling crates for senior dogs is the Petmate Two Door Top Load Pet Kennel. It’s sturdy and secure, so you’ll never have to worry about it falling apart or getting destroyed on your travels. That helps to ensure your senior dog will stay safe at all times. Perhaps the best feature of this kennel, though, is that it has two different entry points. Some dogs don’t like going in the front of a crate. You should never force a dog into a crate, as they can become nervous or even aggressive. By lowering them in from the top, they are less likely to be anxious about it. This crate allows you to do that so that you can lower your pet in safely. 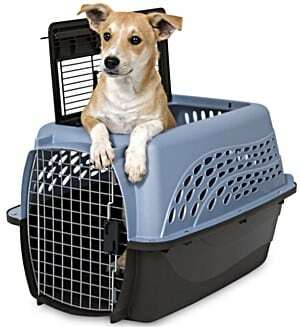 There are small and large versions of the Petmate Two Door Top Load Pet Kennel. The smaller size can carry a dog up to 8lbs. The larger size is a good fit for dogs between 10-20lbs. Be sure to choose the size that gives your dog a little bit of room to lay down and turn around. When it comes to a crate/kennel that you can keep in your home, comfort is vital. Again, sometimes older dogs can become nervous. Or, they may just want a space of their own where they can be left alone in peace. For these instances, an indoor/outdoor kennel is useful. Our pick for the best kennel you can use at home is the NOZTONOZ Soft-Krate Indoor/Outdoor Pet Home. This crate isn’t technically a ‘carrier.’ But, as the name suggests, you can use it both indoors and outdoors. That means you can take it with you as needed. If your dog is staying overnight somewhere, or you’re at a friend’s house for an outdoor event, your dog can come with and be comfortable. Crates like this provide a safe space for dogs of all ages. But, they can be especially useful for older dogs. The NOZTONOZ crate comes in different sizes. It’s suitable for dogs under 15lbs, all the way up to 90lbs depending on the size you choose. Even if you have a larger dog, they can still be comfortable. Unlike more traditional kennels, your dog won’t feel like they’re in a cage. The frame is made from steel, but it’s covered with a tent-like material. The bottom is comfortable and water-resistant, so even if your dog has an accident, it’s easy to clean up. Because you’ll want to take this kennel with you as well as have it in your home regularly, it’s easy to take down and set up again. There is no special equipment required. Your elderly dog will love having a place of their own to go in your home, or if you’re in someone else’s home. Just because your dog is getting older doesn’t mean they can’t enjoy the great outdoors! In fact, getting outside more often is good for senior dogs. But, it’s not always possible for them to walk long distances or run around at the park like they used to. If you want to make sure your dog still gets plenty of fresh air, consider a backpack. Our pick for the best backpack for senior dogs is the Pet Gear I-GO2 Traveler Roller Backpack. With this backpack, you’re getting five things in one! It can be rolled behind you in buildings or used as an actual backpack to keep your hands free. It can also be used as a standard carrier with handles, or a tote or car seat. So, if you’re only going to buy one type of carrier, you’ll get a lot of use out of this one! If you’re traveling in the car, your dog will be secure thanks to the two tethers that attach it to the seat. But, where this backpack shines is outdoors. You shouldn’t have to give up taking walks or going on hikes with an older pet. Even if they can’t make the trip like they used to, they’ll still enjoy and appreciate the fresh air. They’ll also love being able to spend that time with you. They’ll have a soft, plush mat to lay on at the bottom of the backpack, so no matter how long your walk goes they’ll always be comfortable. The carrier can also be expanded up to three inches, so your pet never has to feel cramped. Plus, the mesh sides will allow them to see out. It’s a great way to keep your dog immersed in the great outdoors without hurting their joints or tiring them out too much. If you have a smaller dog that can’t get around easily because of their age, you might want to try a sling. Slings are great for taking walks outside with your pet. But, the best part is you can use them inside, too. It can become more difficult for senior dogs to make their way around the house. That can be a little disheartening for you both! Just because your dog is getting older doesn’t mean they still don’t want to move around or be close to you. Using a sling allows them to do both. One of the best slings for dogs of any age is the Alfie Pet by Petoga Couture Pet Sling. 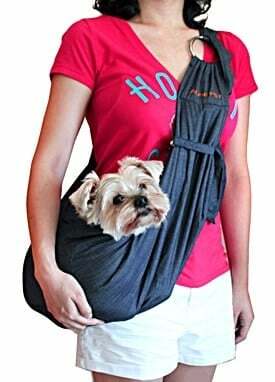 This pet sling allows you to comfortably wear your dog when you’re doing things around the house but keeps your hands free. It’s a comfortable pouch that will keep your dog cozy. But, they can stick their head out of the top, so they will always know where they are and what’s going on. Because the sling rests at your hip, the weight is evenly distributed. That benefit, combined with the padded shoulder strap means this sling will be comfortable for you too. The Alfie Pet sling is meant for dogs up to 12lbs. Of course, other small animals can use it as well, such as cats. The pouch is deep enough so your dog won’t slip out, and they’ll be secure at all times. Dogs with special needs or limited mobility will love being able to get around the house with you again. A final option for getting around with your senior dog is to use a pet stroller. While strollers aren’t technically carriers, they serve a similar purpose. They may not be meant for things like car or airline travel. But, if you have an older dog that can’t get around easily, they provide another great option for fresh air and exercise. Dog strollers are almost like child strollers, with a few key differences. Our favorite pet stroller for older dogs is the Pet Gear NV Pet Stroller. There are a few key features to this stroller that help it to stand out from the competition. First, it can hold dogs up to 70lbs. Most strollers are only meant for smaller dogs. Big dogs are often the ones who have trouble with their joints. So, being able to walk around with your larger dog can be fun for both of you. This stroller also has air wheels, which are almost like bike wheels. That makes it easier to cover all different types of terrain without creating a bumpy right. Older dogs don’t want to get jostled around or suddenly jerked whenever you hit a rock or a rough patch of road. The tires help the ride to remain stable. You can also feel good about the safety features of the Pet Gear stroller. Instead of zippers that can be broken or chewed through, this stroller features a lock on the outside. It also has a mesh screen that allows your pet to get enough air, stay cool, and take in their surroundings. 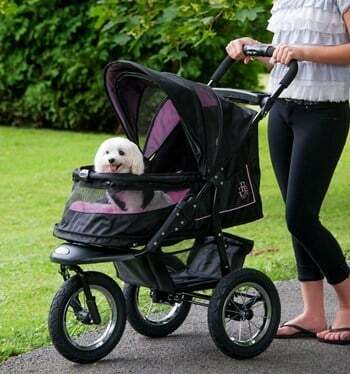 Strollers like this are an excellent way for both you and your pet to get outside more often and get some fresh air. You’ll be able to get some exercise along the way, too! The Pet Gear NV Pet Stroller is just as convenient for you as a dog owner as it is for your pet. 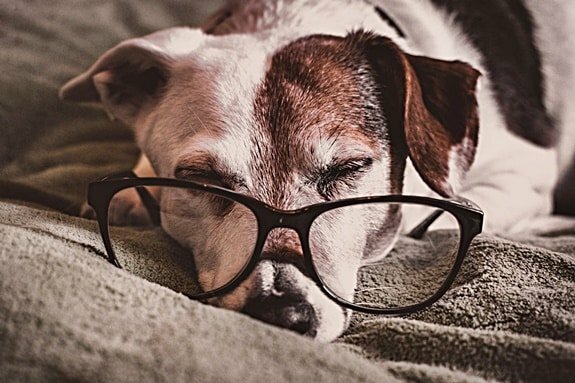 Keep your pet comfortable: Comfort is important for an older dog who might have aching joints or muscles. Carriers with padding can help them to feel safe and give them a chance to rest. Keep them cool: Dogs can overheat easily, so carriers that can keep them cool in a variety of ways are beneficial. One of the best ways to do this is with mesh windows or siding. Make sure that enough air is allowed to flow through the carrier, so your older dog doesn’t have to worry about panting like crazy just to stay comfortable. Mesh windows also allow you to check on your dog quickly to make sure they’re doing okay. Keep them safe: Safety is the most critical feature of any carrier. Things like interior harnesses, seat belts, reinforced zippers, and locks are all great features. Older pets are usually calmer, but you know your dog better than anyone. If they have a hyper personality, buying a carrier that is strong and durable will be essential for their safety. Enjoy using the carrier: Pet carriers should be convenient and easy to use for you. If a carrier is hard to clean, store, or put together, you’re less likely to use it regularly. But, if it’s easy to do those things, you’ll be happy to use it all the time. As a result, your dog will be able to go more places with you easily. It’s important to fully be aware of your dog’s personality and physical abilities before you travel with them. Some old dogs will lose weight and might not mind going long distances. Others may not do as well. The good news is that all the carriers listed in this article are great for different types of travel. If you have an older animal, you might be making frequent trips to the vet. Choosing a carrier that is convenient for that, like the Sherpa Deluxe Original can be a significant investment. If your dog gets nervous when they’re traveling, you might want to try a top-loading option, like the Petmate Two Door Top Load Pet Kennel. If you want to go longer distances with your pet, you can relax. All the carriers and crates listed in this article are airline approved. They meet the standards necessary to take them on a plane. You might feel more comfortable taking your older dog with you on a business trip or vacation so they won’t be alone. That way, you can attend to their needs even if you’re not at home. Putting them in a kennel or hiring a dog-sitter may not work for them if they need special care. Finally, a little exercise and fresh air are great for older dogs! Using a pet stroller or backpack is a wonderful way to let your senior pet enjoy the outdoors without having to walk long distances. Choosing the right kind of carrier will depend on the type of traveling you most frequently do. Older dogs all have different needs. Some can still be spry and energetic. Others may have joint and muscle issues. Others may just want to rest and sleep most of the day. Whatever the case, your dog will always want to spend time with you as much as they can. That’s why the carriers listed in this article are all excellent choices. You can choose your carrier depending on the type of travel you want to do. Then, decide how your dog might respond to that particular type of carrier. If another one would be a better fit, it’s best to decide what would work for the dog, rather than your travel plans. Something as simple as having your hands free at home while wearing a sling can take away a lot of stress for you. We hope this guide has been helpful if you’re trying to think of the best option for your older dog. The right carrier can make life easier for both of you. What Are the Best Pet Carriers for Dogs up to 30 lbs?